When Ava DuVernay’s A Wrinkle in Time tessers into theaters in March, it won’t just be one of the biggest films of the year, it’ll also serve as a benchmark for the power of women in front of and behind the camera. 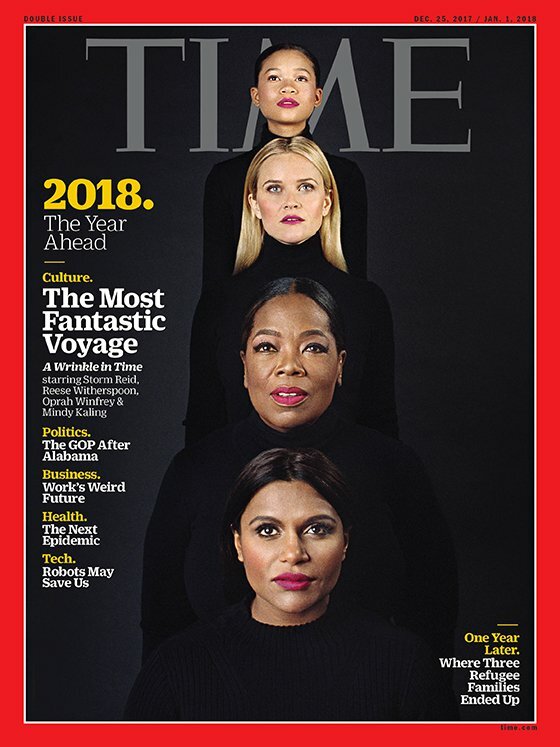 A Wrinkle in Time‘s four dazzling, female leads — Oprah Winfrey, Mindy Kaling, Reese Witherspoon, and Storm Reid — appear on the most recent cover of Time, as the magazine looks ahead to 2018. And based on the cover alone, 2018 can’t come soon enough. While the novel, A Wrinkle in Time by Madeleine L’Engle, is 55 years old, its timeless themes of good versus evil, the importance of love, and embracing individuality are more relevant than ever. And now, after decades of producer Catherine Hand trying to bring Meg Murray to the big screen, 2018 will finally see that dream realized — with a crew of dedicated women, and a few men, at the center of it all. While the film features appearances from many of the most sought-after actors in film — Chris Pine, Zach Galifianakis, Gugu Mbatha-Raw, and Michael Peña join the fabulous leads — the women behind the out-of-this-world trio are more than just popular actresses. When it came to the three celestial beings who guide Meg (Reid) as she travels through space and time, director Ava DuVernay wasn’t simply looking for superstars. Rather, she was looking for women who were not only powerhouses on-screen, but also represented the celestial beings in real life. Witherspoon — who in addition to being one of the most lauded actresses of her generation has been at the forefront of actresses producing quality roles for women — remarked to Time how important it is for directors like DuVernay to demand inclusivity. Because directors like DuVernay not only break up the boys club that often exists in Hollywood, but create dynamic films. We’re already getting goosebumps! A Wrinkle in Time premieres on March 9th, 2018, and it can’t come soon enough.